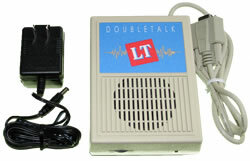 DoubleTalk LT is the portable member of the DoubleTalk voice synthesizer family. Because it relies only on a simple external connection to your computer, DoubleTalk LT can go wherever you go. It works with virtually any PC or laptop equipped with an RS-232 serial port. Operation is from a 9 volt alkaline battery, or AC wall adapter (included). 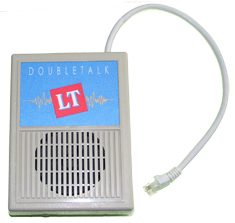 Based on the RC8650 chipset, DoubleTalk LT is a totally self-contained voice synthesizer. Speaker, headphone jack, volume control, and serial interface are all built into the unit. No special software or drivers of any kind are required; simply plug the unit into any standard RS-232 serial port and send it the text you would like read, just like it was a printer. With its superior responsiveness and intelligibility, and wide screen reader software support, it's no wonder why DoubleTalk LT has become the synthesizer of choice among thousands of visually-impaired PC users. DoubleTalk LT-R45 is designed for use with devices capable of supplying DC power directly to the unit, thus eliminating the requirement for a separate AC wall adapter or battery. Power and RS-232 serial communication are all derived from a single, 12-inch CAT5 cable and RJ45 connector. Enhancements have been made to increase the output volume's dynamic range through software control alone, for situations where it isn’t practical to allow manipulation of a manual volume control. The default power-on greeting allows the user to easily determine the version of the firmware installed. Minimum order quantity normally applies for this product.